Description: These plants are dioecious. The male and female flowers are tubular with 4, curling, pointed lobes. The male flowers have 4 stamens, while the female flowers have a long, fuzzy, white, two-branched pistil. The female flowers are followed by up to 1/2 inch (13 mm) wide, shiny black berries. The leaves densely line the branches and are small, stiff, opposite, narrow, and bright green in color. Most of the branches are prostrate, but a few of the shorter branches are upright. Unlike many other members of the genus Coprosma (Copro is from the Greek word for dung), this plant does not have foul-smelling foliage or fruit. 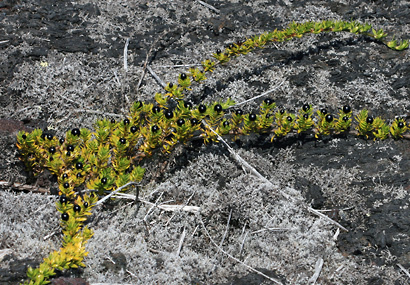 'Aiakanene is found growing in sunny, open, upland areas, and it is a common colonist of higher elevation lava flows and cinder fields. 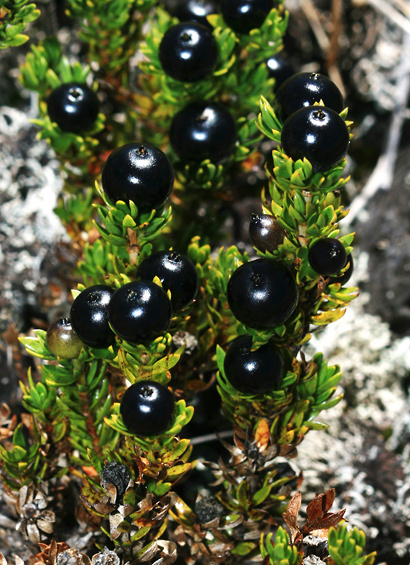 The berries are a favorite food of the endangered Hawaiian goose, the Nene (Branta sandvicensis). 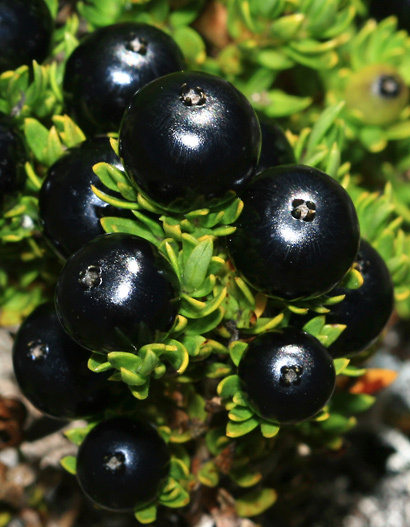 Edible – The ripe berries are edible, but they are flavorless and were used by the Hawaiians as a laxative, so they are not the best for eating.